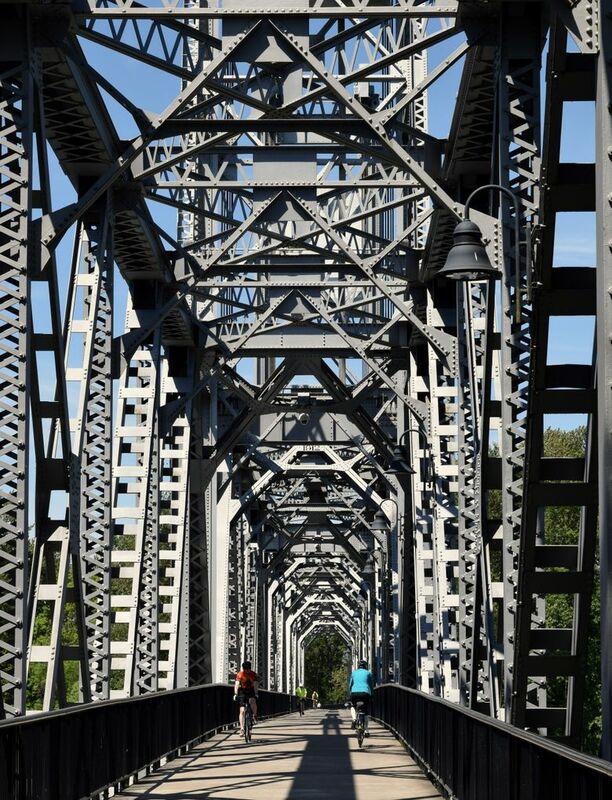 The capital city of Salem has a flashy new bike bridge and its own Ale & Cider Trail to woo cyclists to explore this historic gem on the Willamette River. And it’s near the center of the path of totality for the August 2017 solar eclipse. SALEM, Ore. — Ten a.m. is a tad early to start tasting microbrews, so I slipped the handsome Salem Ale & Cider Trail passport into my bike pannier and pedaled off to explore the bridges. 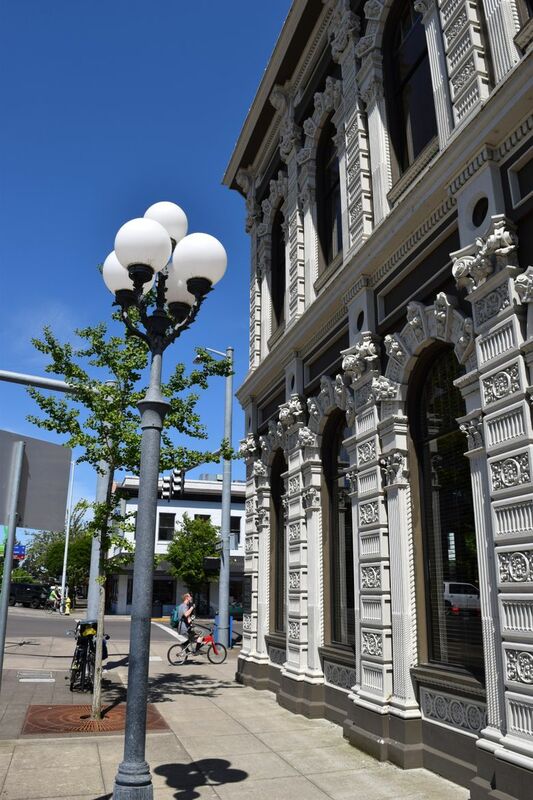 This modern-day Oregon Trail adventure provides a convenient excuse to cycle around the parks and streets in this city of 160,000, explore the state Capitol topped with its gilded gold statue of the pioneer man, and visit Willamette University, the Northwest’s oldest. And if your plans include an Oregon sojourn to see the August 21 solar eclipse, here’s a good diversion — near the center of the path of totality — for before or after the big event of 2017. While we were at it, my riding partner and I planned to sample the local food scene. We were, after all, in the verdant Willamette Valley, the beating heart of Western Oregon’s booming agricultural world. The Peter Courtney Minto Island Bicycle and Pedestrian Bridge is open weekends only through July to allow for removal of a temporary structure used in building the bridge, but will be open permanently by Aug. 2. Oregon’s capital is a bridge town, like its big brother downstream on the north-flowing Willamette River. 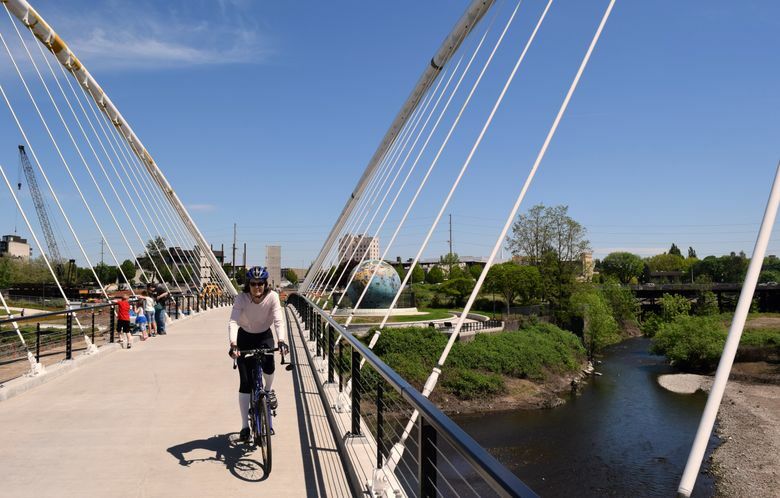 But while Portland’s broad-shouldered spans connect densely packed neighborhoods, smaller Salem’s bridges connect you to parks across from the compact city center. Like Portland, the town has recently opened a bike/pedestrian-only bridge to enhance two-wheeled exploration. Downtown bike lanes lead to bike trails in Riverfront Park. We pedaled north past the colorful Gilbert House Children’s Museum and onto the Union Street Bridge, a converted railroad trestle. Passing under its crisscrossing steel beams, we turned onto Wallace Marine Park’s riverside trail that gets you close enough to check that the current is indeed running the wrong way. We looped back over the bridge and south, past a historic carousel to the much more interesting new bridge to Minto-Brown Island Park. The winged structure, which opened this May, sits next to the Eco-Earth, a 26-foot-diameter ball that was an acid storage facility for a riverside paper mill formerly on the site. 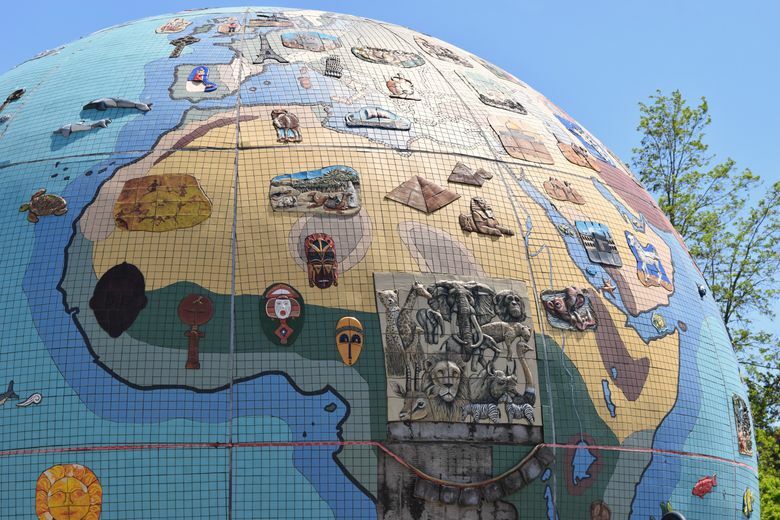 The big ball has been colorfully tiled and transformed to look like a globe. The bike-pedestrian bridge, cutely spanning a river slough where salmon spawn, connects the city center to the expansive, uninhabited island and its smooth asphalt trails. Marshy meadows with forested backdrops deliver excellent birding. City leaders call the bridge and associated trail “the last critical link” in connecting 1,300 acres of parks and more than 30 miles of off-street trails in the Salem area. And although still in town, I felt the tug of the rural valley just beyond. We resisted the urge and instead headed back downtown to fuel up before our ale exploration. The gaggle of cyclists lunching in front of Venti’s Café, 325 Court St. N.E., testified to the street tacos, and this quick, informal spot evoked a healthy aura. 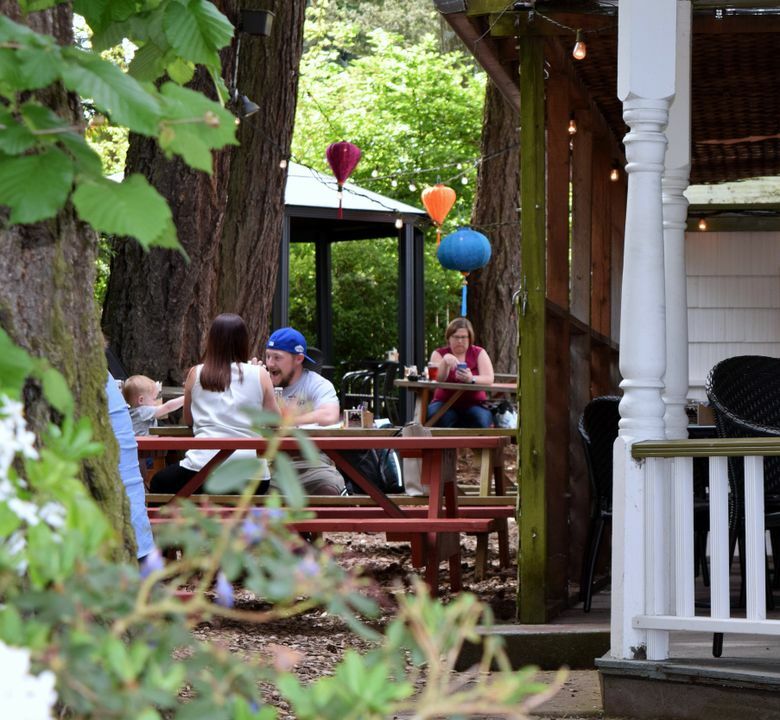 Although visitors stream into the surrounding countryside for renowned wines, craft ale and cider are adding new energy into Salem, as in other Oregon locales (there are ale trails in Bend, Eugene, the Rogue River valley and the north-coast towns). We felt an attention-getting vibe. 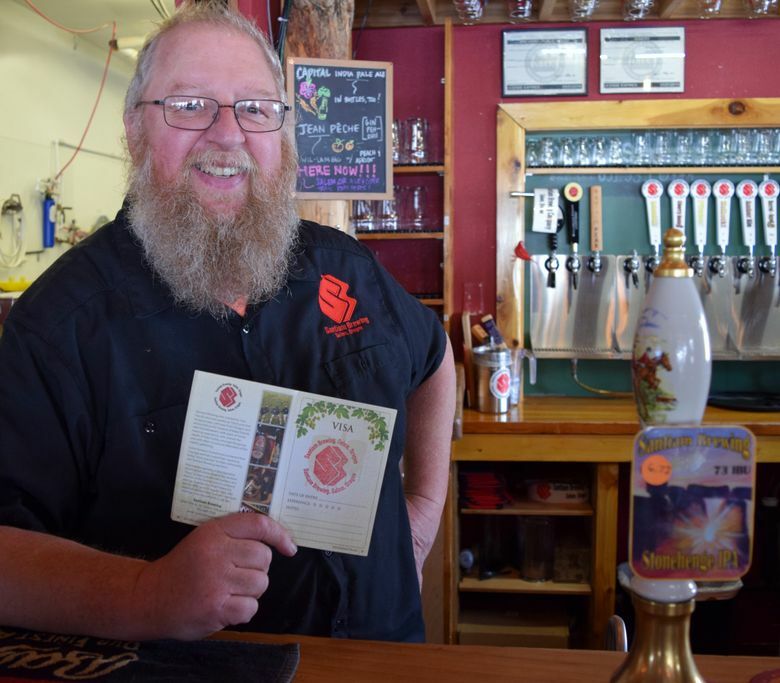 “We started the ale trail because of a perceived lack of appreciation … about how many breweries and cideries are in this area,” said Ian Croxall, gregarious owner of Santiam Brewing, at 2544 19th St. S.E., who led us through a warehouse filled with small batches of beer aging in repurposed wooden wine casks. Tasting their glowing red cherry hefeweizen (echoing Salem’s nickname of “The Cherry City”), I was refreshed as well as surprised, as the flavor and the brewery were both new to me. On a scant 20-mile tour, we pedaled to all six local breweries in an afternoon, stopping at four of them for a taste or reconnaissance. Spread around town, they take a bit of poking through the neighborhoods to find, but we could mostly stay off the few busy roads, among quickly dissipating traffic that would make a Seattle cyclist smile. We pedaled past the Reed Opera House, which held the state’s first mall, opening in 1870 with seven shops. At the edge of downtown we passed the uniquely themed Museum of Mental Health, housed in the Oregon State Hospital, the filming location of the classic “One Flew Over the Cuckoo’s Nest,” written by revered local bohemian Ken Kesey. Santiam sits south of the museum, in a boxy commercial park by the airport. Nearby, Salem Ale Works was planning a move to bigger digs, so we will return to try SAW beers in their scenic new spot facing the runway. The recently expanded Gilgamesh Brewing operates a busy restaurant down the road. A couple of miles due west of Gilgamesh is McMenamins’ local offering, Thompson Brewery. Naturally, it has a storied past, having been Salem’s first post-Prohibition brewery. Hanging out at a picnic table in its shady side yard, you might feel like you’re visiting a home-brewing friend. Heading across town to Vagabond Brewing, we detoured by Ram Restaurant and Brewery, another familiar name. At the southeast corner of Willamette University and a half-block from Amtrak sits the original location of the Ram chain. The company had been brewing in Salem since 1995. At our northernmost stop, we encountered possibly the quietest bar ever. The pool tables and sound system in Vagabond’s spacious beer hall were hushed and the half-dozen bar customers seemed to be meditating. Most of the floor had been taken over for … a yoga class. As we tiptoed in, a lotus-posed instructor took dozens of supine students through breathing relaxation. We learned in whispers that “Yoga + Beer” is a monthly event at Vagabond, and the hosting studio moves it to other locations weekly. As the chatter swelled to a post-yoga peak at Vagabond, we set off south again into Salem’s core, on the trail now of cider. Impeachment was on tap at the charming 1859 Cider Company in an alley off Liberty Street in downtown Salem, four blocks from Oregon’s seat of political power. It hit all the marks: carefully crafted, resolutely local and eminently accessible. We ended our tour at the cidery, around the corner from the visitor’s center where I scored the $5 “passport.” I’d gotten halfway to filling it with visa stamps to qualify for an engraved pint glass after visiting all 12 locations. Still remaining: another cidery south of Salem’s airport that’s only open for a few hours on Friday afternoon, as well as two breweries in nearby Silverton and a brewery and cidery in farm country by Independence and Gervais. After a dinner of tapas and local veggies over quinoa at Taproot Café, a block down on Liberty’s alley at 356 State St., we pedaled through sleepy streets to a quiet Airbnb room. Completing the passport, along with trips to the verdant valley beyond the capital city, would have to wait for another sojourn along this latest version of the Oregon Trail.